Star Trek boldly traveled through space and into the heart of the human condition. 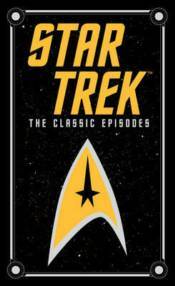 This anthology collects 45 classic episodes that aired in the series first three seasons. Adapted by James Blish and J. A. Lawrence from scripts by Robert Bloch, Harlan Ellison, Richard Matheson, and other leading science fiction writers, they include: Amok Time, The Doomsday Machine, The Trouble with Tribbles, and Hugo Award-winners The City on the Edge of Forever and The Menagerie.